My peas are starting to come up in the garden. Their vines are such a cheery sight in the spring and then the first food to pick in June. 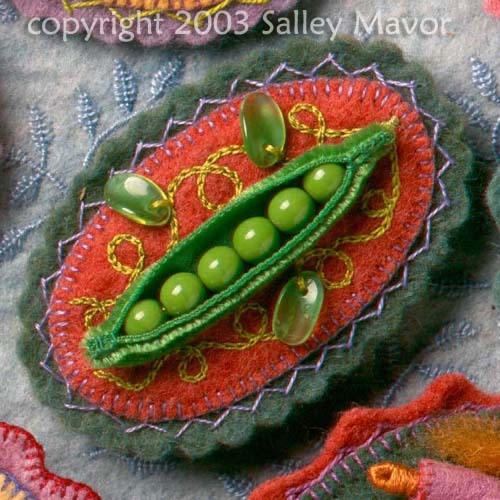 This series of closeups begins with a peapod pin made with velvet ribbon and green wooden beads. You can read the story about my pins here. 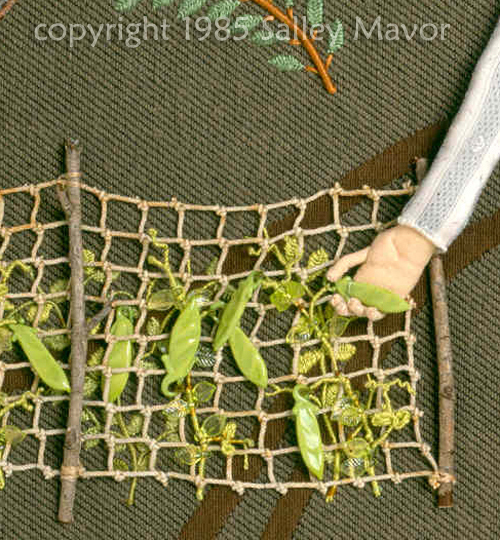 Here’s a detail from “Picking Peas”, a fabric relief from 1985. The full scene is on another post here. The peapods are glass beads. I must have figured out how to knot the string to make the net or cut a piece out of an existing net. 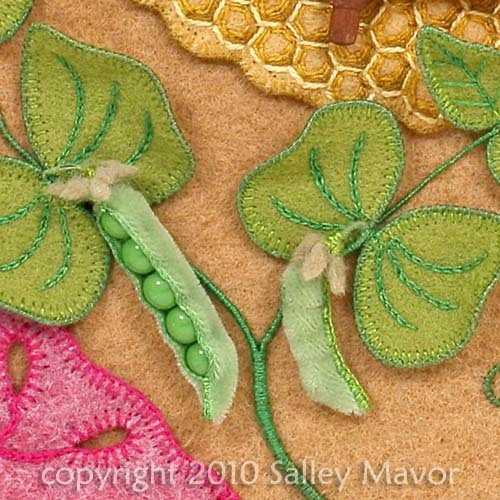 The peapods in this illustration from Mary Had a Little Lamb are made from seed beads sewn inside thin satin ribbon. This is a felt pin from my how-to book, Felt Wee Folk. The peas in the ribbon pods are glass beads in both this photo and the one below. 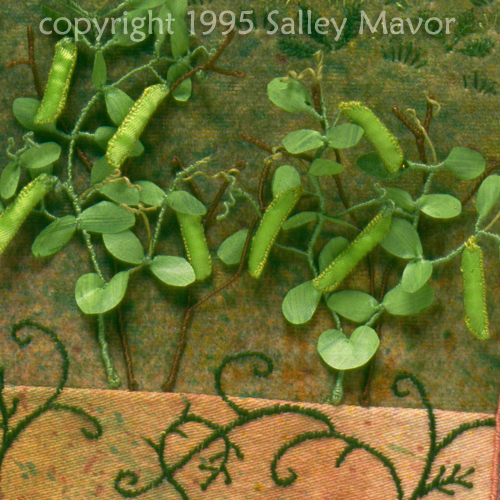 Here are some felt pea vines from an illustration in my upcoming book, Pocketful of Posies. Note: See other posts in the Close-ups series archive here. 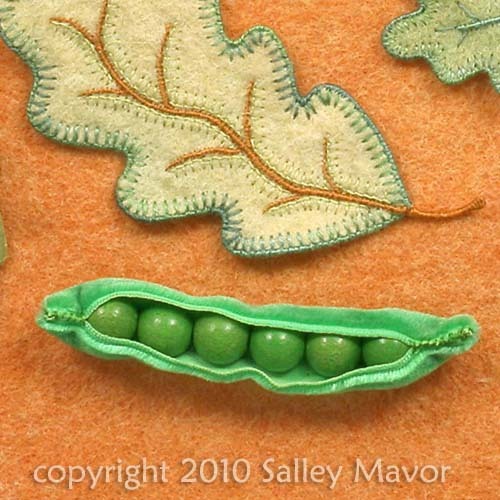 This entry was posted in Closeups, Fabric Relief, Felt, Food, illustration, Pins by Salley Mavor. Bookmark the permalink. What a delight to see the pea pods today!!! You clever, clever girl!!! Thank you for sharing your fantastic work!!!! Salley, your spring peas look amazingly crispy and sweet! Your abilities to translate into fiber art our natural world is a precious gift indeed. Thank you for sharing your enticing pea pods with us today. I’ve been following your blog since just before you broke your wrist. I have to save I am just truly amazed at your talent. Although, I do not consider myself an applique artist, I do dabble with embroidery thread on occasion. Your artistry has inspired me. Thank you for showing close detail of your work. I cannot imagine the patience you have. You are a master of needle and thread. The first embroidery I can remember doing was in high school, on my blue jeans and the pocket of a blue work shirt for a “boy friend”. I’m sure that many of you had similar experiences. Since then, I have taught myself stitches as I need them, referring to instruction books. I’m always pleasantly surprised to hear from you all and blush a bit while reading your comments. Thank you! What can I say, your blog just simply makes me happy!! Hope your wrist continues to heal and thanks for sharing your magic. Peas! One of my favorite things…how happy this post makes me! As always, your attention to detail is wonderful –and mind-boggling. Look at that fence and those tiny pods! All the peas are fabulous! I can only shake my head. I stare at the tiny peas and . . . simply shake my head. Amazing!